Illya Filshtinskiy made his orchestral debut at age 15 playing the Schumann Piano Concerto with the Springfield Symphony Orchestra. His most recent orchestral performance of Rachmaninov's Second Concerto with conductor Peter Stafford Wilson was broadcast on the public radio station WOSU. "Filshtinskiy demonstrates and impressive command of technique and an even more impressive command of interpretation. He is willing to hold out a moment, to suspend listeners in time almost to the point of uneasiness, in order to make a musical point. He is also willing to overwhelm a small space with sound, and to suddenly switch gears for a delicate, melodic passage." -The Columbus Dispatch; regarding his solo concert in Columbus, Ohio. 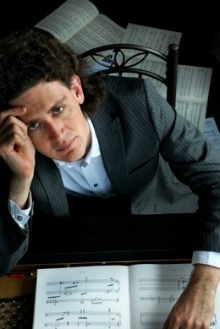 Illya made his New York debut in 2002 after winning Grand Prize in the 2002 World Piano Competition. As a result, he was invited to perform at New York's Carnegie Hall and the United Nations Headquarters. Since then he has performed in many venues in New York including Symphony Space, the Metropolitan Museum of Art, Liederkranz Hall, and Steinway Hall. He has participated in a contemporary music tour of Turkey, as well as given concerts and masterclasses in Holland, Quebec, Taiwan, Singapore and Japan with violinist Katha Zinn. Illya holds a Bachelors Degree from the Juilliard School, a Masters Degree from the Manhattan School of Music, and a Professional Studies Diploma from Mannes the New School for Music. He is a member of aTonalHits, a group dedicated to bringing contemporary and lesser known works to light. The group has worked closely with the Societe de Musique Contemporaine du Quebec, presenting a recital with three of Quebec's foremost composers, including a premiere of Jean Lesage's "Portrait of a Sentimental Musician in a Distorting Mirror". aTonalHits is largely dedicated to new music, having premiered over 80 works. Illya is responsible for all of the video work and photography produced by the group. The group has been selected as featured artists at the new MySpace website, and has also taken part in TED events. They have released an album of Schnittke Sonatas, as well as a new album entitled "1910-1920", which focuses on a variety of different violin and piano music from that decade.